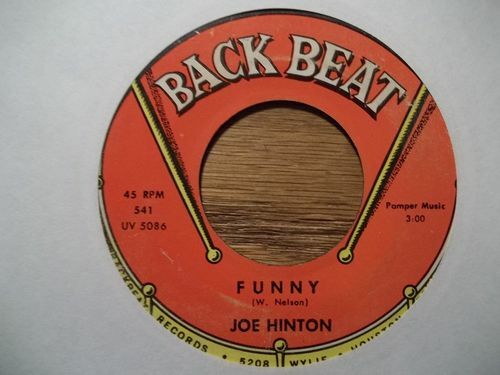 Soul Serenade: Joe Hinton, "Funny"
In 1964 Joe Hinton broke out with his hit cover of a Willie Nelson song. Four years later he was gone in the prime of his career. There I was a couple of weeks ago, listening to my favorite radio show, hosted by the legendary DJ Dave the Rave (click on his name to see how you can listen too). Dave played a record by Joe Hinton, but as you might imagine on a show called “Relics and Rarities,” it wasn’t Hinton’s big hit. It did however serve to put me in mind of Hinton’s hit, and inspire this week’s column. Joe Hinton was born in Evansville, IN, and got his start as a gospel singer. Do you see a recurring thread here? In 1957 he moved to Memphis and joined a gospel group called the Spirit of Memphis Quartet. His work with the quartet caught the year of Don Robey, who owned the group’s record label, Peacock. Robey suggested a crossover to secular music for Hinton, and signed him to Peacock subsidiary Back Beat. Hinton’s first few singles didn’t make a dent, but his fifth release, “You Know It Ain’t Right,” finally hit the Billboard Hot 100. He also had some chart success with his next single, “Better To Give Than Receive.” But it was his 1964 cover of Willie Nelson’s “Funny” that cemented his place in soul music history. The record went to #1 on the Cash Box R&B chart, and #13 on the Billboard Hot 100 pop chart. The song, also known as “Funny How Time Slips Away,” appeared on Nelson’s debut album in 1962, but by then it had already been a modest hit on the country chart for Billy Walker in 1961. Jimmy Elledge had a hit on the pop chart with his cover that same year. After Hinton’s success, the song was covered by numerous artists including Jerry Lee Lewis, Billy Joe Royal, the Supremes, Al Green, the Spinners, Elvis Presley, and George Jones. Joe Hinton had success with his follow up single, “I Want A Little Girl.” It was his last chart hit. Hinton died of skin cancer in 1968. He was only 38 years-old, depriving the world of the great music he undoubtedly would have made had he lived.